Togetherness (mostly) over kebab at the Bakalians! When taking some visitors around Beirut recently, I realized that I was talking like an old-timer. Remember, you don’t have to be old to talk like a senior citizen. I was pointing to this place where there used to be such-and-such school, and the other place where so-and-so used to live, and on and on. I’ve only lived about a dozen years of my life here (and not even my formative years), but here I was, talking about the place as if I had been here all my life. To be fair, I can talk in the same fashion about nearly any place I’ve lived, but this place is nowhere near where I was born. So, here I was giving the “insider’s tour” of our neighborhood, from the post-Genocide era, to the pre-Civil War era, to the ups and downs of the past 3 decades. 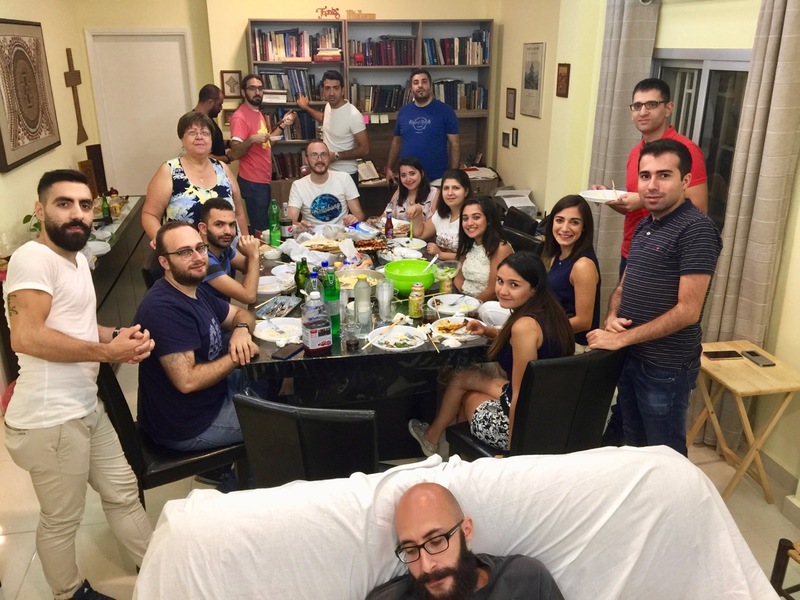 It offered a strange satisfaction, a deeper sense of belonging, while at the same time reminding me of the responsibility to pass along the heritage I have inherited (and chosen), particularly the Western Armenian and Armenian Christian heritage. The fact that I might know more than most people about this background is largely irrelevant. 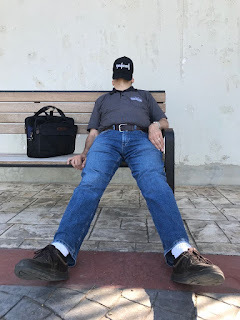 There is so little I know, and so much catching up I have to do to begin to grasp it all… even as an old-timer… or a perceived old-timer / know-it-all. Armenia word meaning “with spirit”. Ha. One of my new favorite spots to eat is a little hole-in-the-wall kebab sandwich place, a 10-minute walk from home. The proprietor and sole worker there is a youthful and light-hearted, 70-something Armenian woman, whose friendliness and focus on providing high-quality food is a rare commodity. Eateries in this city can be pretty snooty places, even cheap eats, but Angele easily finds a way into your heart, and you into hers. She gets up before dawn each day, chops her fresh onion and parsley, gets to the butcher for fresh meats, switches butchers if she feels they are slipping in their quality, and lines up her skewers in small quantities in the refrigerated display for her regular customers. 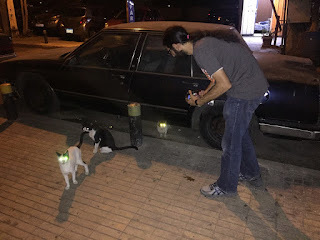 When I stopped by she talked about how, a few days ago, Persian Armenian visitors to Lebanon kept coming back day after day, even bringing friends to eat there. Sometimes Angele recruits willing friends to help with the chopping, but she is the one and only cook. Puts the charcoal on, sets the blow-drier to intensify the flame (they keep breaking down, and her brother keeps fixing them), peels the skin off the tomatoes after she cooks them, tosses on the right amount of spices to make a delicious sandwich… and charges almost nothing for it. At every turn she thanks the Lord for helping her. “It’s enough for me to live on – that’s all I need, praise God.” In a country of debt-based living, it’s an outlook on life that a lot more people need to share. The summer zoomed by us. We started out serving as counselors for the youth camp, then I got to be recording secretary for the church union’s annual meeting, and in between we got to see brother-in-law Vicken for a very brief visit. After that we spent a month (sort-of together) with our son Sevag, who was making his second annual appearance here. We enjoyed Lebanon for a few days, visiting Rayaq, where a lot of Armenians settled after the Genocide, until they emigrated to Armenia in 1946. 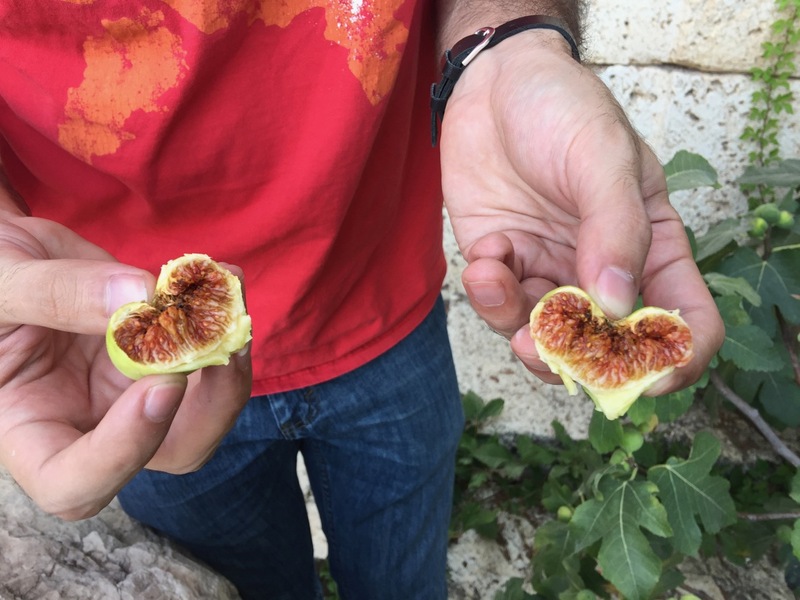 We ate the most flavorful – not sugared – Arabic ice cream (in the Beqaa village of Saghbine). Sevag then did his second annual stint as a leader at the Armenian Evangelical Children’s Conference in KCHAG while we departed for Armenia to get ready for yet another big conference… “Zoomed” is the word. 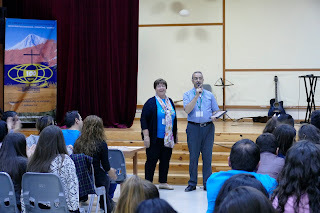 Over the past months Maria and I had been filling our days and nights as directors of the worldwide Armenia Evangelical Youth Conference, organized by the Armenian Missionary Association of America for its 100th anniversary. (Read about Day 1 through Day 14 here.) 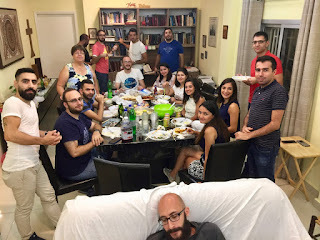 Sevag, along with the Syria & Lebanon group, joined us a few days after we arrived Yerevan, with about 140 other youth and mostly young leaders from a bunch of different countries for a two-week conference. (Read his interview in Armenian here.) The most memorable part of the plan was, predictably, the service opportunities the youth had, in teams of 4 to 10 people, heading out to various cities and villages. Each team did something different, whether helping run Vacation Bible School, or making jam, or doing housecleaning, or planting rooftop gardens, or visiting lonely elders in border villages, or refurbishing dwellings, and on and on. The conference got them culturally enriched and spiritually challenged, and then provided them an outlet to give to others a portion of what God was filling them with. Good, good times. Emerging mostly unscathed through all of this, Maria and I realized anew that this kind of leadership is something we need to encourage, advise and challenge in others. Because, simply put, we are old-timers! Happily, there are at least a few out of the youth with whom we worked throughout the summer who will likely do very well as tomorrow’s and today’s leaders. News update: it seems the ants noticed that they were getting very little social media traction from their antics in our apartment, so they took a break from bugging us. That and a bit of spray from a store that sells organic stuff seem to have done the trick. For now.